We are very encouraged to report that members of Congress and the Senate are leaving DC today for a two week Spring Break without having passed Dream Act Amnesty bills HR 6 and S. 874! This is very strategically important for our efforts to stop the DC establishment once again in their attempt to rubber stamp and make permanent this elite sponsored illegal alien invasion and overthrow of our American republic. The bad news is that the new historic level of illegals coming across our border with the assistance of Soros groups, drug cartels, and our own US Border Patrol agents acting under the Obama and Bush directives of Catch and Release that President Trump is continuing may be enough to hand Democrats full control of America in 2020. If so, it will then become impossible for American citizens to reestablish civilian control through a process of elections and laws. The fact we have pushed back the Kushner timeline on these Amnesty bills gives us another two weeks to build up knowledge and opposition to the bills! 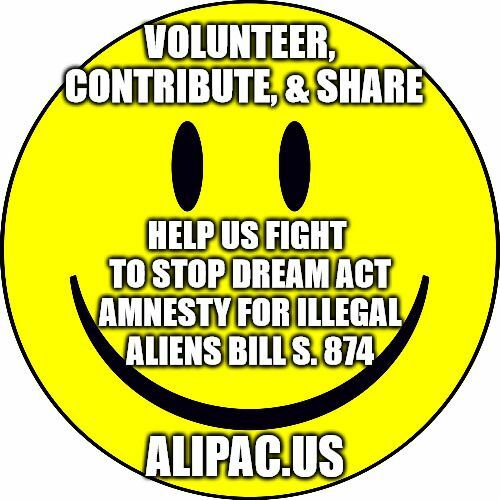 We are so thankful for each of you standing up for the truth and standing up to fight back against Amnesty and illegal immigration through ALIPAC. Together we are getting stronger and more influential each day. Last edited by ALIPAC; 04-12-2019 at 01:02 PM. Beezer, Airbornesapper07 and GeorgiaPeach like this.